Welcome to our 'Fox Den'. Our camping years have taken us from tent to tent trailer to using my parents trailers or renting a trailer. We eventually bought an Arctic Fox travel trailer......thus the name. We don't try to spend too much time inside the den as it's the outdoors we leave home to enjoy, but I do enjoy my little kitchen that is set up with most everything I have at home in a smaller version, and when there are no hookups I do some things manually. Like making coffee. When we began tenting 35 years ago Scot's parents gave us a few camping items from their stash. One of several things that we still use regularly is the coffee perk which we now use to boil water. From the days I worked at Murchie's Tea and Coffee I still have my Melita cone filter holder that sits upon an insulated coffee carafe, and this is how we begin our mornings while camping. ...or lattice topped apples. This recipe is in our Celebrations Cookbook. We often will let our kids, parents and friends know where we are camping and it's fun to see their vehicle pull up and we spend the day together around the camp fire, picnic table, taking a walk or fishing. A big part of back road lake side camping for me is the solitude. This table is where I sat and gathered thoughts and wrote my story for Celebrations. Several weeks ago we camped here again and I sat at this table thinking about how God helped the 10 of us to gather our recipes, stories, and Bread for the Journey's together. Although we do most of the cooking together, Scot is the chief griller when we camp. Where's the cheese? Inside the patties...try it sometime! A cast iron pot should be in every ones camping supplies. We have a little oven and stove top inside the Fox Den, but anything from fresh baked breads, to pulled pork are done outside on the Big Green Egg. It's become our camping companion. When we go to this particular spot I'm always hoping a spot with a view of the lake from the kitchen window will be available. A kitchen with a good view for just $12.00 a night....now that's value! My hand crank food processor was one of the first things that walked out of my kitchen at home into the Den's kitchen. It has an assortment of blades that slice, dice, whip and whirl. All you need is a little muscle power. I like to put little baggies with frozen fruit into the trailer freezer to make up a nice cool treat for hot summer afternoon. Frozen blueberries and raspberries, a fresh banana, Greek yogurt and rice milk churn into a thick smoothie/yogurt treat. Frozen fruit also bakes up into a cobbler or crisp when we want dessert. Sometimes we make friends with neighbouring campers and invite them to join us. 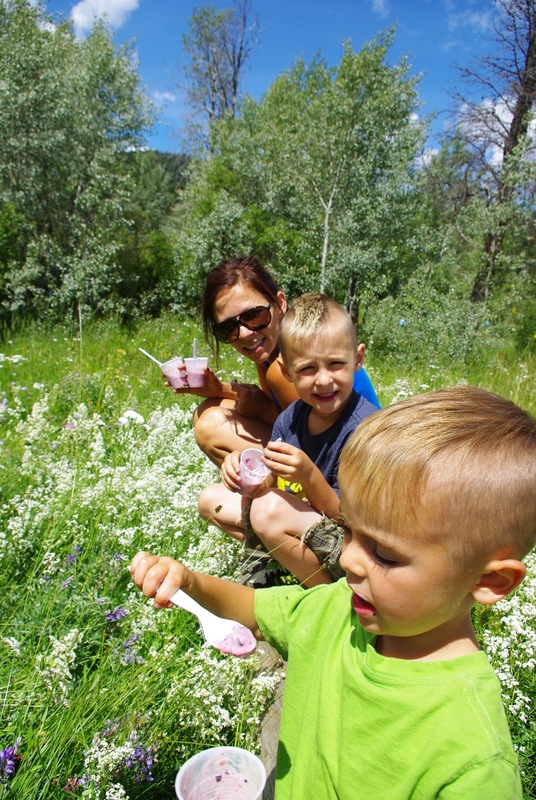 And the best way to enjoy a cool treat is sitting on a log amongst meadow flowers in 'our back yard' . 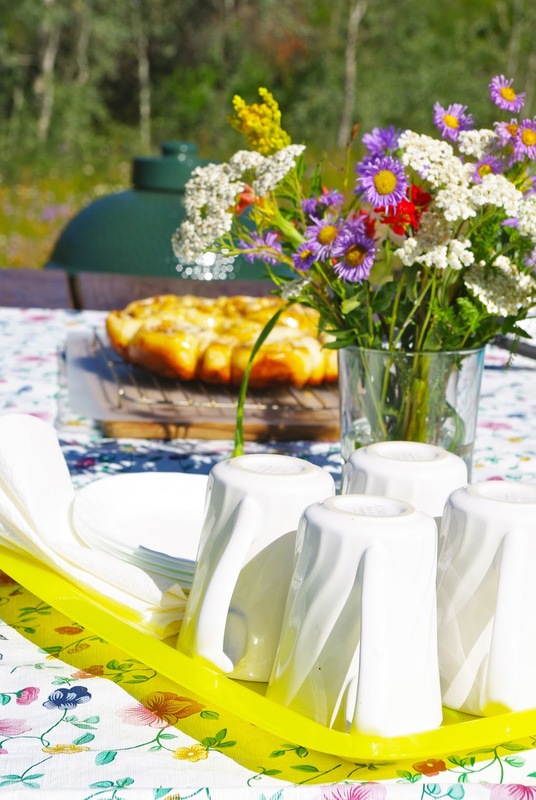 If you happen to see us while camping....you are always welcome to join us at our picnic table. Oh what fun and good eats!!! We still haven't decided on a camper but you make it look so easy and fun. Wow- baking cinnamon buns and fresh bread in your camper - awesome! Love your hand crank food processor. Such a great picture of those adorable grands enjoying their treat! Sounds wonderful Kathy. I'm there. HI Sharon, because the brand of our trailer is Arctic Fox....we called it the Fox Den. What a great post Kathy! We too love our camper although we don't get out in it as often as you do. Cooking is always fun in it - such a small kitchen but everything right at hand to make a great meal. A small kitchen also means less clean up - always a positive thing when there is the great outdoors to explore. Grilled hotdogs are my favorite--probably because that's the only time I eat them! What a great post! 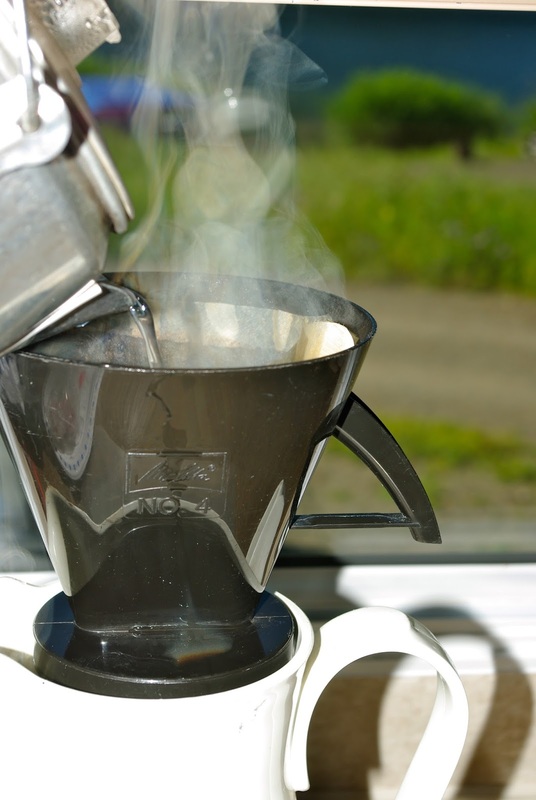 We also enjoy camping and one of our issues has been the coffee-making device. I really like your idea and wonder where you got your thermos and filter? I see that it is a Melita brand and wonder if still available? The thermos is actually a coffee carafe that is very well insulated. I think you should be able to find them at any department store. Buy a good one....it's worth the extra $$ spent for keeping the coffee really hot for a long time. The cone shaped filter...I bet you could find one at Value Village or similar type store. Not sure where you can buy them new but check out a department store too. I think that I'd be a fan of camping if I'd grown up with your example! What a lovely set-up. Oh Kathy, I was reminded of so many things from your camping experience. We too had a trailer, but we cooked everything outside...starting from scratch. Whoever got up first had to crack a fire to heat the water for coffee and we use exactly the same method. We also have the old cast iron pot...boiling with water over the campfire. What a great experience...but our 'den died' and so we try to find rustic cabins and still bring all that stuff along. Many memories for me as you shared this post. Kathy what size is your green egg, we have one for home and have thought about one for camping but was told the minis are to small and the small weigh to much. Hi Kathy, I have to ask, are your camping cinnamon buns made with a yeast recipe? I have waited to ask, hoping you would maybe post the recipe this summer. I have done some yeast baking in our motorhome, but thought there may be a quicker recipe.